When doctor James Maskalyk decided it was time to “put something back” and take a break from his work in the Emergency Room of a Canadian hospital, he chose to apply to be a volunteer with Medecins Sans Frontiers and told them he’d go ‘anywhere’. The organisation sent him to Sudan in 2007 to work in a hospital in small town called Abyei. During the six months that he was in Abyei he kept a diary and wrote a blog about his experiences. MSF didn’t always appreciate the blog and worried that what he wrote might upset the authorities in Khartoum. Returning home, profoundly moved by the experience, those diaries and his blog entries formed the basis of this book ‘Six Months in Sudan’ in which he is determined to tell the things that he couldn’t say in his blog whilst he was there. I guess he’s probably burned his bridges with MSF who possibly would have preferred him to keep quiet about how things were in his little part of Sudan. 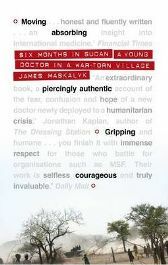 I think many of us probably suppose that MSF only jump into action when there’s a major crisis or conflict but this book shows us that a lot of their work is going on in the background whilst war rages elsewhere in the same country. For most of Dr James’ time (not surprisingly his colleagues and patients don’t even attempt his surname) in Sudan he’s in a relatively quiet part of the country, despite it being on the border between the north and south with the potential for conflict to break out at a moment’s notice. Most of the time he’s tucked away from too much direct evidence of what’s happening elsewhere. At times it seems the greater danger is one of boredom and frustration rather than dodging bullets. He deals with an epidemic of measles that would be considered a pretty minor issue if it were in Europe but is life-threatening in Sudan and treats severely malnourished children as well as all the accidents and diseases great and small that befall the residents of the town. From gun shot wounds to the aftermath of badly-delivered babies, the field doctor has no choice other than to roll up his sleeves and get on with it despite inadequate equipment, poor medicine supplies and local politics all conspiring to get in the way. Not all the volunteers can cope and several leave early because they can’t deal with the way the hospital is run and this seems to be more of a problem than dealing with death and disease. Despite the location of Abyei, straddling the border between north and south Sudan, I learned very little about the conflict in Sudan from reading this and actually I didn’t mind that at all. I was shocked by events at the end of the book but in general this was not a book about civil war; it’s about life (and death) in a small ill-equipped hospital where no matter how hard the staff try, there’s no way they’ll ever be able to treat everyone and where the rules of their organisation tie their hands and prevent them from sometimes doing as much as they want to. To be honest, they could have been anywhere, in any understaffed and under equipped hospital and the same stories of beautiful little orphaned children, widowed men and women left with no way to take the body of their loved one for burial, parents weeping over sick children, would all be very similar. You don’t need to care about or be interested in Sudan to find this book fascinating – it’s about six months in the heart of darkness, six months in your worst nightmare of medical neglect or six months in a place so hot your brain would fry just to think about it. If I have one niggle with the book, it’s around the blog entries. These are all written entirely in lower case and I found that irritating. It’s only very near the end that you learn why that’s the case and the reason seemed pretty tenuous to me. Social media and the internet are not an excuse for what basically just reads as bad punctuation. I didn’t need lower case to tell me when it was a blog extract and I found that affectation a bit irritating. Maybe someone stole the shift key off his keyboard – who cares – it could have been fixed on return to Canada. Many such ‘worthy’ books have been written and many fail because the writing is just too dull, too detailed or too self-obsessed. Maskalyk hits none of these buttons. He writes clearly, unemotionally, with humour and great observational skills. He shows the reality behind the image of the field doctor – the obsession with small mundane routines like counting the steps from his hut to the hospital, the small celebrations when someone in the team cooks a great meal or one of the patients makes an unexpected recovery. You will feel like you’re there with him when you read about his six months in Abyei – you might even feel like you’d love to invite him round for a beer and a chat about his experience, and you’ll probably feel no fear that he’ll get boring or preachy. No Comments on "Six Months in Sudan"